When I worked at the china store, most customers were --as one would expect -- shopping for wedding gifts, replacing pieces of dinnerware broken by their grandchildren, or looking for a public restroom. Occasionally, however, a crafty customer would arrive in search of supplies for some creative DIY project. One day, I helped a woman who was intently combing through the clearance china, searching for a matching dinner and salad plate. She only wanted one place setting and she wasn't particular about the pattern. 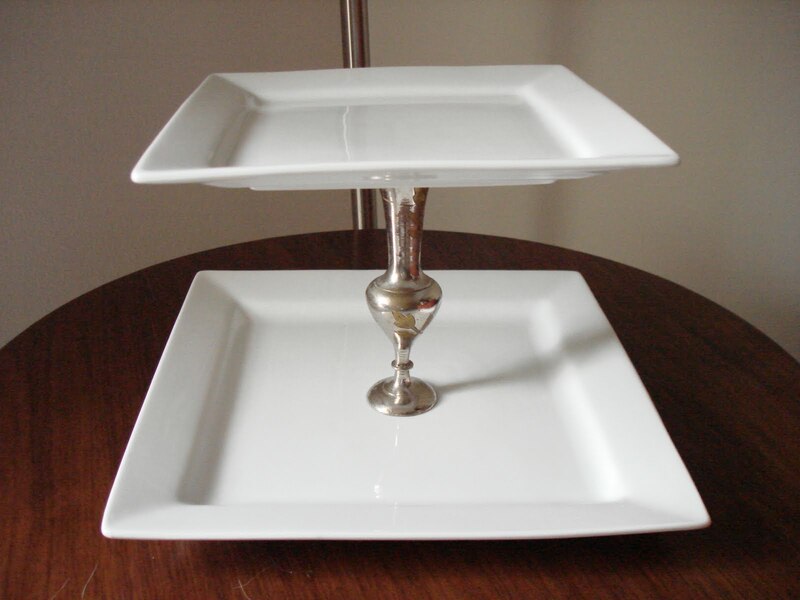 She finally explained that she had seen tiered servers made of plates separated by candlesticks. The customer didn't elaborate on the particulars and ultimately left empty-handed, but I was intrigued by the idea and it stuck with me. Granted, I have so many serving pieces that I couldn't possibly cram another one in my filled-to-the-brim kitchen. My sister recently purchased new everyday dinnerware and I saw an opportunity to give this project a go. My sister bought square, white stoneware dishes, so I found a matching dinnerplate and salad plate to create a two-tiered server. Stoneware, however, is so heavy that fine china (easily found at thrift stores) or lighter-weight dinnerware (like Corelle) would probably be a better choice. I purchased a small metal bud vase to act as the spacer between the plates, but an appropriately shaped candlestick would work as well. Whatever you choose, the object should have a level top and bottom and a wide enough rim on each end that it can be securely adhered to the plates. Finding a suitable adhesive also took some work. Since the tiered server will hold food, I thought it was important to use a non-toxic adhesive. Unfortunately, it seems that the strongest, most durable bonds would be formed by construction adhesive or similar glues (you know, the ones with emphatic ingestion warnings printed on the labels). I settled on Weldbond®, a non-toxic adhesive that claims to bond wood, tile, glass, ceramics, etc. I cleaned both plates and the bud vase, then marked the center point of the bottom of the smaller plate and the top of the larger plate. I began with the bond between the top of the bud vase and the bottom of the salad plate; I put the small plate right side down on my work surface. I traced the top of the bud vase lightly with a marker in the center of the underside of the plate. Then I applied the glue thinly on both the bottom of the plate and the top of the bud vase and allowed it to dry for about five minutes. When the adhesive was tacky, I put the surfaces together and placed weight on top of it. I let this bond cure overnight. The next day, I similarly applied glue to the center of the top side of the dinner plate and the bottom of the bud vase. 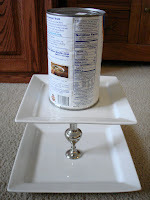 When the glue was tacky, I balanced the bud vase/salad plate atop the dinner plate, then placed weight (I used a large can of chicken broth) on the salad plate. Once again, I let this cure overnight. As I said above, the stoneware is so heavy that it was difficult to get an adequate bond between the dinner plate and the vase. After repeating the process a second time, however, the bond held and my sister's server was complete! This would be a great way to make use of old dishes that you maybe don't use as tableware but can't stand to throw away. Those great old plates that fill aisles of secondhand stores? 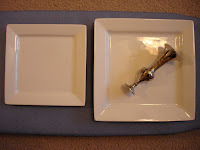 Maybe even an extra place setting of your current dishes could become a functional, coordinated serving piece. Be creative and enjoy! Thanks! If your dishes are heavier ceramic or stoneware, you may want to consider a more powerful adhesive. I wanted to use a non-toxic glue, but honestly I wish the bond was a little stronger. Wow! thank you! I'm going to start creating for my daughter's dessert buffet at her wedding reception!